St. Petersburg is an amazing city. We have been exploring, walking all over, and loving it. You are always close to water here—it's been called the Venice of the North. Peter the Great built the city out of what was then marshland and created a series of canals. It is very beautiful and adds to the charm of the city. One of the things we discovered as we explored the waterways was the "marriage locks." We actually learned about these from our friends at Moscow Greeter, but didn't actually see any when we were in Moscow. 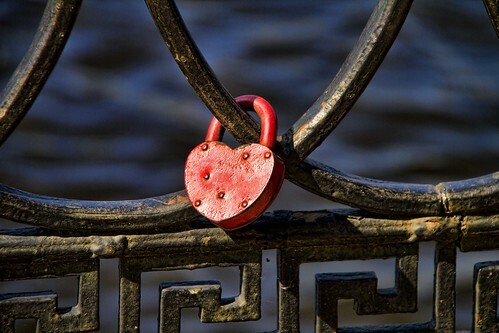 The locks are mostly heart-shaped locks that newlyweds hang on the bridges in both Moscow and St. Petersburg. 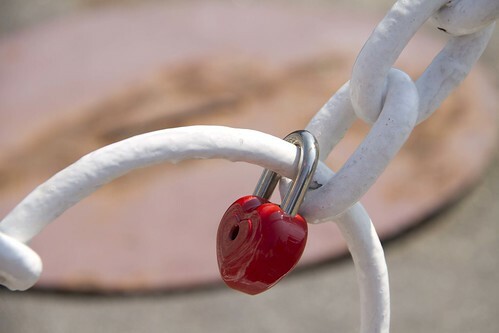 It is a tradition to show that their love is sealed forever. 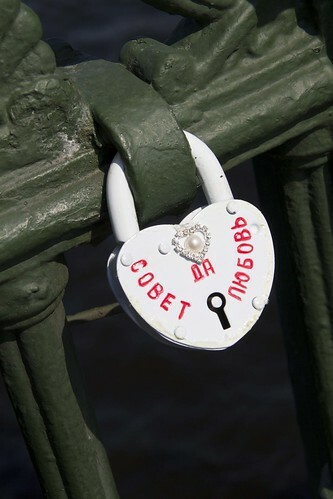 Once the couple is married, they go with the wedding party to their favorite bridge and put the lock in place (they add their names and the date on the lock). Then the bride takes the key and throws it into the river below. Such a romantic and beautiful custom. What a beautiful tradition! And you have caught the beauty and simplicity of these locks and what they represent. I only hope that the marriages have the endurance expressed in this custom. Great idea, it looks so beuatiful!